In the Appointments Module, on the right under the calendar, is the Pinboard area. The pinboard is a useful tool for moving or scheduling appointments. Drag an existing appointment from the appointment schedule to the pinboard. When viewing Patient Appointments, click Copy to Pinboard. Or, double click the planned appointment in the Appointments for Patient grid and click Pinboard. From the Recall List, click Sched Family or Sched Patient. From a Planned Appointment, click Copy To Pinboard. You can have multiple appointments on the pinboard at one time. Press Clear to empty the pinboard and return any existing appointments to their originally scheduled time. If your schedule is booked out for more than a few days, manually searching for a slot can be time consuming. Instead, easily search for available openings. Note: Schedules must be set up for the search to work, as search results show openings for scheduled providers in the selected appointment view.To control search behavior, see Appointments Module Preferences. Place the appointment on the pinboard and click Search. The first available time slots will show for each of the next 10 available days. Click More to see the next 10 results. Click on any date to jump to it in the schedule. After (Date): Click the dropdown to select a date from a calendar. Before/After (Time): Enter the time restriction to search. Entering both a before time and an after time searches for openings between the two times. For example, enter Before 4:00 pm and After 12:00 pm to return openings from 1:00 pm to 3:00 pm if available. Providers: Lists providers currently included in the search. Click Providers to select from the Provider list. Hygienists: Immediately search all providers who are hygienists. This will only show non-providers who are selected in the appointment view. Results can be filtered by date, time, or Provider. If you change criteria, click Search again to refresh results. Time slots in blockouts that do not allow appointment scheduling are not included in the results. See Blockouts. If a user is restricted to a clinic, search results will only appear for openings in the clinic the user has access to. When you find a suitable date, drag the appointment off the pinboard, then click X or Close to exit. To search for an available appointment based on additional qualifiers, click Advanced. 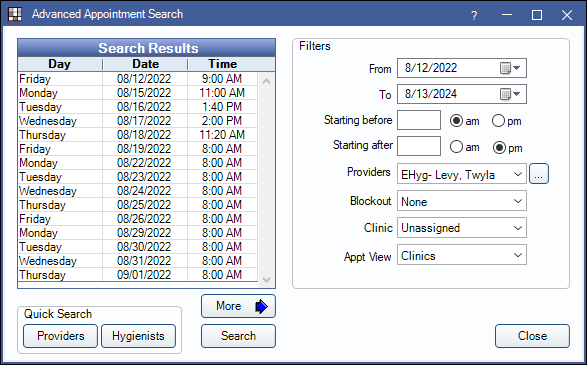 The Advanced Appointment Search window includes all the same options for searching by date, time and provider. Additionally you can specify a blockout type, clinic and/or an appointment view. Blockout types with the Do Not Schedule type will not appear in the dropdown list. Selectable clinics will be restricted based on the current user restrictions, if any. It is also possible to search in specific Appointment Views, or across All at once.